A bank broke 134 years of tradition by opening its doors on a bank holiday for the first time. A branch of Lloyds TSB in Islington, north London, offered counter services and financial advice but closed at lunchtime. A company spokesman said all staff working on Monday were volunteers. Bank holidays were first enshrined in law in 1871 to give office workers days off and banks closed forcing other businesses to shut as well. 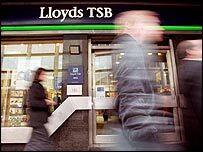 A Lloyds TSB spokeswoman said: "It's very much a local decision. We are trying to provide a customer service. "We expect our branch managers to understand the area they work in and specifically the needs of their customers. "The branches themselves are testing to see whether customers want it and will use the services on offer." The bank has warned any transactions carried out at the branch in Upper Street will not be processed until the next working day as the country's clearing system remains closed.